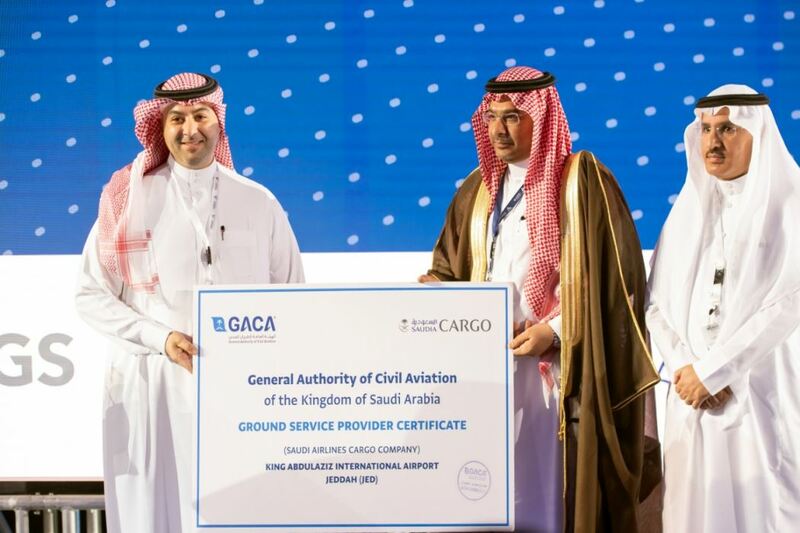 April 15, 2019 - PRLog -- The General Authority of Civil Aviation (GACA) has approved Saudi Airlines Cargo Company's completion for all technical & operational standards achieving high levels of compliance with the global rules & regulations of aviation security & safety by providing it the operating license for ground handling service providers (GACAR 151) during the Global Aviation Summit that occurred in Riyadh under the patronage of Custodian of the Two Holy Mosques, on April 1-2, 2019. On this auspicious occasion Saudia Cargo's CEO, Omar Hariri thanked the General Authority of Civil Aviation for their trust & consistent support to the Air Cargo & Ground Handling industries & said: " This license will further enhance Saudia Cargo's ground handling capabilities & opportunities thus increasing the logistical income into the Saudi economy in line with the Saudi vision 2030 that aims to transform the Kingdom into a global logistics hub." Saudia Cargo provides a variety of ground handling services for international air cargo carriers operating through the Kingdom of Saudi Arabia's main international airports (Jeddah, Riyadh, Dammam and Al Madina). Fully equipped to handle different aircraft and cargo types, Saudia Cargo serves many different airlines and express companies with the ability to handle more than 1.7 million tons of cargo per year, supported through a dedicated and trained team and well-equipped warehouses.